Published on September 10, 2012 by Jennifer S.
One woman, one bicycle, and a search for dead relatives. I am not a genealogist. I used to work with a woman who was fairly intent on finding a connection between herself and everyone else in the building. That is a bit intense. I believe it is good to have some knowledge of family history, but grandparents, great-grandparents, and a layer of cousins or two is good enough for me. However, combine anything with bicycling and exploring Hartford’s history, and I’m game. 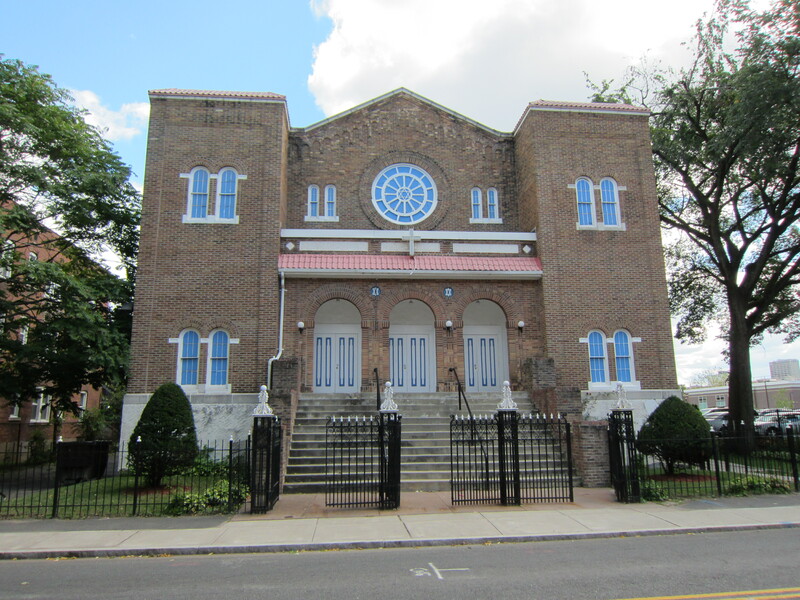 Garden Street Synagogue. Jacob Richman was a founding member of the congregation. 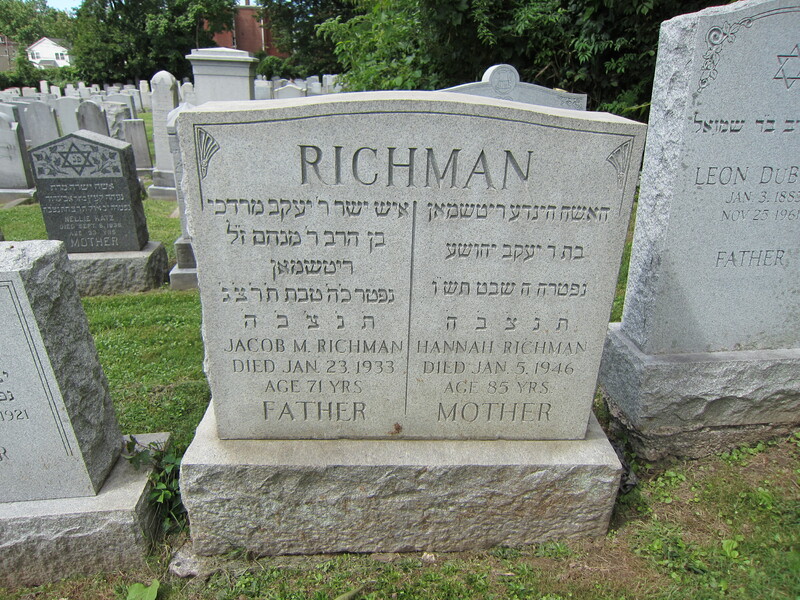 Regular readers of this blog (*chuckle*) will recall a post from earlier this summer in which I discussed my great-grandfather, Jacob M. Richman. Recently, a cousin found that post. On Friday evening I had a phone conversation with him, during which he told me about the work he is doing on our family tree. He asked me what I knew about when Jacob came to Hartford, and if we have any idea when he actually came to the country. None of this information is easy to find. When the cousin sent me the link to the information he has gathered, I admit, I was hooked. The timing was really perfect. I need things to focus on in between sending out job applications. If I had called the cousin when he originally contacted me, I would have had all the resources of the CHS at my disposal. Alas, having waited a couple weeks, I had to sign up for the free two week trial of Ancestry.com. After reviewing much of the information on the tree, I decided it was time I did some exploring. I have visited my maternal grandparents grave many times; it is quite nearby. Never, though, had I seen the graves of my their parents. Locations in hand, helmet on my head, and camera in my pocket, I set out for the cemeteries. 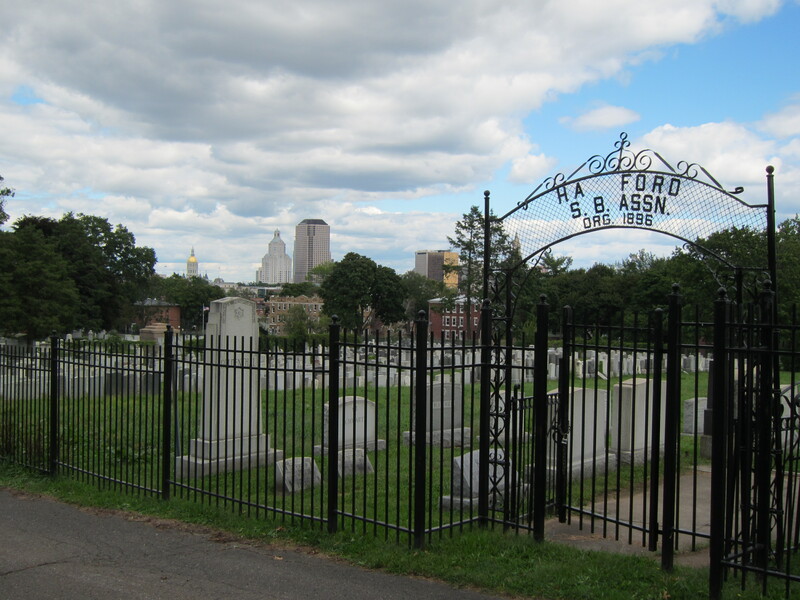 Hartford’s first cemetery, now known as the Ancient Burial Ground, has always been in the heart of the city. As the years went by, the residents of the city came to the conclusion that living so close to death and disease might not be the best policy, not to mention the cemetery was filling up. For their next burial ground, the residents went north, starting Old North Cemetery. Later, Hartford’s first Victorian era cemetery, Spring Grove, would be put into place a few blocks away. 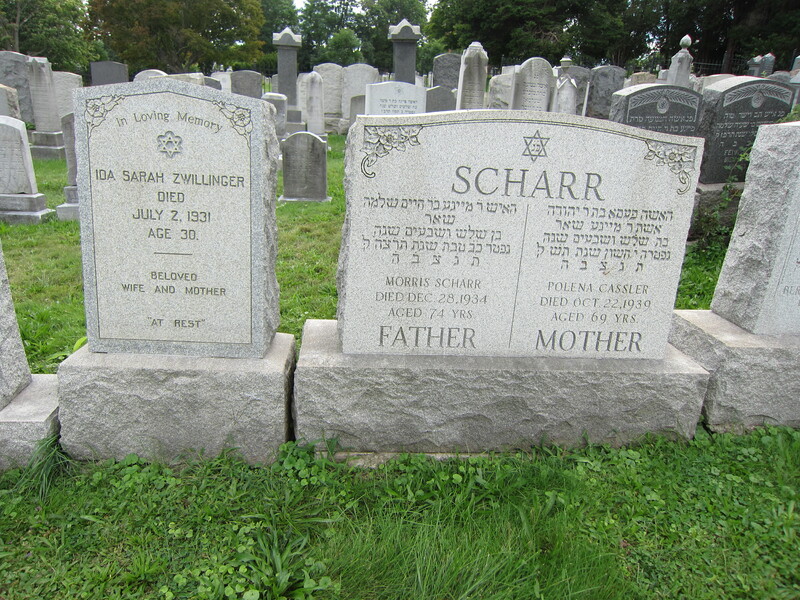 The Jewish cemetery where Jacob and Hannah Richman are buried is adjacent to Spring Grove. 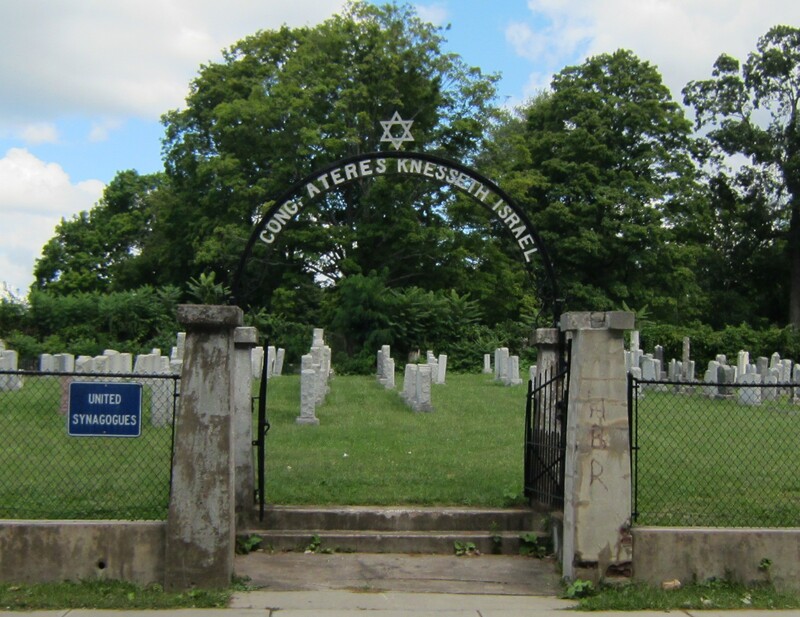 It is one cemetery, occupied by three Jewish organizations, one of which is now known as the United Synagogues of Greater Hartford. From what I had found on Ancestry, I knew Jacob’s grave was “X53.” Unlike some cemeteries that label their sections, the only markings visible were on the stones themselves. I had no idea where to start. Looking back, I’m fairly certain I started at Row A. It took a while to get to Row X, but eventually I did. Walking up and down each row, I found a few other cousins as well. There was plenty of room between rows for me to walk with my bike. In most cases, there is so little space between headstones, everyone underground must be pretty cozy. Next I rode south to Zion Hill Cemetery. I have passed Zion Hill countless times. I couldn’t get to my graduate courses at Trinity College without going by. Yet, I had never been in there. Part of the reason for this is the surrounding fences and gates do not make it appear very welcoming. I entered through the first open gate I found, only to realize later that there were many open gates, and a main entrance. fortunate was that Morris and Paulina Scharr were in the first row I walked down. 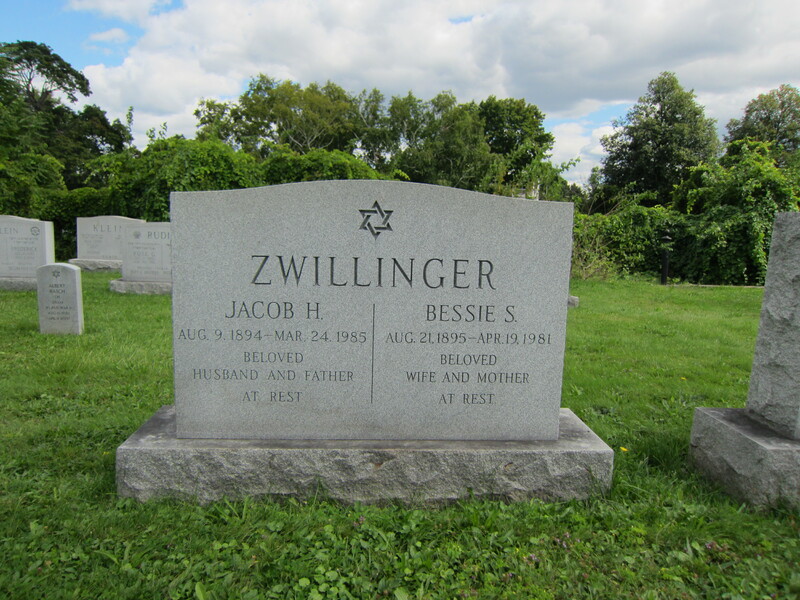 Since they were “G32” and “G31,” respectively, I then knew which direction to head to find their daughter and her husband, Bessie Scharr and Jacob Zwillinger. Even though this morning I had found an obituary for another daughter of Morris and Paulina, Ida Scharr Zwillinger, I had somehow missed the fact that she is buried next to her parents. I was glad her headstone caught my eye as I was heading back out of the cemetery (it seems that Bessie Scharr’s first husband died, and following Ida’s death, Bessie married Jacob Zwillinger; it cuts down on the relatives at Thanksgiving). Ida Scharr Zwillinger and her parents, Morris and Paulina Scharr. Within two hours I had biked through the city, located the markers for several relatives, and visited two Hartford cemeteries I’d never explored before. It was a great way to spend a crisp, late summer/early fall day. Overall, finding the cemetery plots was fairly easy. Some of the roads were a little sketchy, but being on the bike reinforced to me how close these memorials have been to me. I love living in a place that I know so well, yet there is always someplace new to explore. I was left with one unanswered question. Why did we give the dead people such a great view on the city? 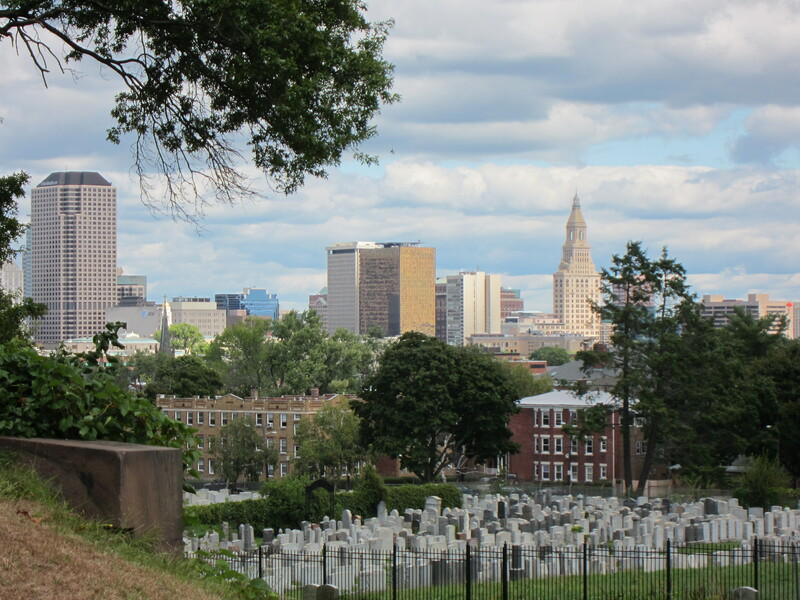 View of the Hartford skyline from Zion Hill Cemetery.